Chicken drumsticks are flavorful, fairly fatty cuts that stand up well to grilling, and remain moist when cooked over high heat. 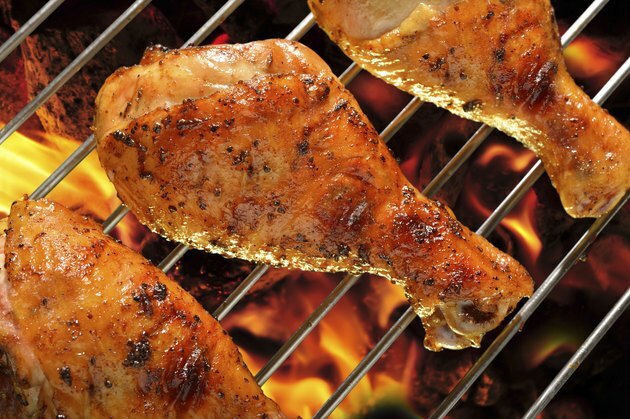 Cooking drumsticks on the grill at a moderately high temperature is the best grilling method because the meat stays tender and moist while the outside is crisp and golden brown. Serve chicken drumsticks with fresh green vegetables or baked potatoes for a classic, healthy meal. Remove the skins before cooking to lower the fat and cholesterol content, and use fresh herbs to reduce the amount of salt needed to flavor the chicken. Pat the chicken drumsticks dry with clean paper towels. Cover them with plastic wrap or aluminum foil to warm them up to room temperature for 30 minutes. Preheat a gas or charcoal grill to 400 degrees F. If you are using a charcoal grill without a temperature gauge, this will take about 20 minutes. Brush the grates of the grill lightly with vegetable oil to prevent sticking. Brush the chicken drumsticks all over with vegetable oil and season them with sea salt or kosher salt and freshly ground black pepper to taste. Put the chicken drumstick on the hottest part of the grill and cook them for 25 minutes, rotating them frequently with a pair of tongs to ensure even cooking. Remove the chicken drumsticks from the grill and put them on a warm serving plate. Let the chicken drumsticks rest for five minutes so the natural juices can redistribute throughout the meat before serving them. Season the chicken drumsticks with freshly chopped rosemary, oregano or thyme right before putting them on the grill for added flavor.